The westbound lanes at the intersection of Hwy 6&50 and 25 Rd. 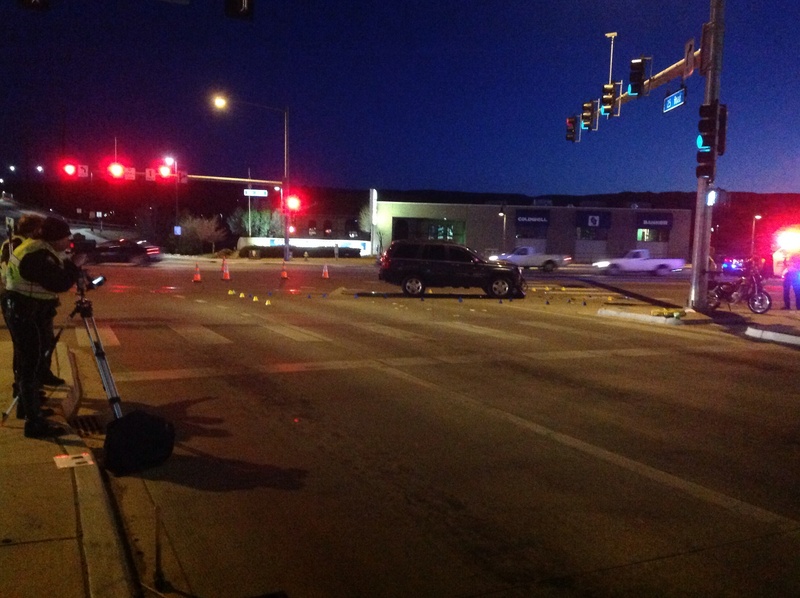 remain closed at this time while Grand Junction Police officers investigate a two vehicle crash that sent a woman to the hospital with what appeared to be very serious injuries. Investigators are asking for anyone who witnessed this crash to call the non-emergency dispatch number (970-242-6707) and provide information about what they saw. At this point we believe the driver of a Jeep Cherokee was traveling northbound on 25 Rd trying to turn left onto westbound Hwy 6&50. We believe the motorcycle rider was southbound on 25 Rd and was entering the intersection when the two vehicles collided. Officers observed what appeared to be very serious injuries to the motorcycle rider. She was transported to St. Mary’s Hospital. Neither the driver of the Jeep nor the two passengers were injured. The westbound lanes will likely remain closed for another couple hours while investigators map the crash site. We will update this blog when the lanes reopen. She is in my thoughts & prayers. If her family sees this, please let me know if I can help. I can put some family members up.